Close your eyes for a moment and think back to when you were a kid. Recall the dinners you ate with your family. Now, what color or colors are most vivid in your memory? Chances are, the colors you see on the table when you’re remembering these dinners represent the foods you were most commonly served. Yellow and red? A lot of spaghetti. Brown? Meat loaf. White? Potatoes, mashed and otherwise. Aqua? I don’t even want to know. My childhood dinner table was normally awash in reds and yellows, with a sprinkling of green here and there, whereas my husband’s was a virtual rainbow. My late mother-in-law chose the foods she presented at each meal based on their colors: a main course heavy in yellow, such as pasta, needed a green accompaniment; brown and white called for a splash of orange (carrots) or red (beets); and so on and so forth. Little did she know that she was way ahead of her time with her color medley. Fruits and vegetables that are rich in color provide an abundance of nutrients. According to the 5aday.org website, operated by the Produce for Better Health Foundation, each color or color grouping has specific characteristics that target various aspects of bodily health. Red, Blue, and Purple foods contain lycopene and antioxidants which promote heart and urinary tract health, can help protect against cancer, and improve memory. These foods include apples, beets, strawberries, peppers, blueberries, raisins, and radishes. Green foods have various phytochemicals that promote healthy vision and strong bones and teeth. Some of these vegetables (like kale, cabbage, and Brussels sprouts) may offer protection against cancer. These are your typical green beans, peas, spinach, and broccoli, among more exotic choices as arugula, kiwi, and endive. Yellow and Orange fruits and vegetables—such as oranges, lemons, and squash—contain carotenoids antioxidants and vitamins that boost your immune system, help your heart, and promote good vision. White foods help you maintain a healthy heart and good cholesterol levels. These include cauliflower, onions, bananas, and white peaches. They can also reduce blood pressure. 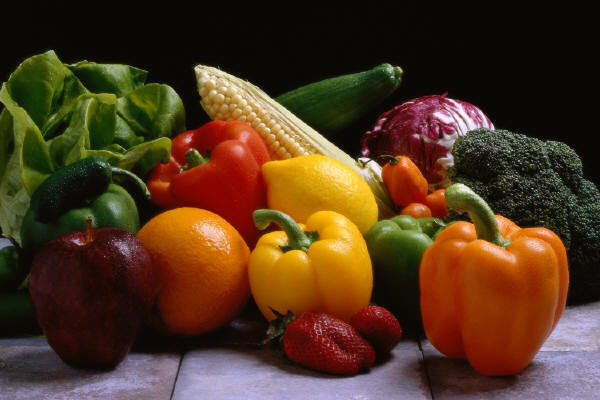 Studies are continuing on the effect of colorful fruits and vegetables on certain types of cancers. Lycopene, especially, has been in the news as current research indicates that it might prevent prostate cancer, a common and treatable (if caught early) cancer in men. Even processed tomatoes contain beneficial amounts of lycopene; so don’t feel too badly if ketchup is the closest thing to a vegetable your kids will eat. A diet that is rich in color is also an optimum diet for losing weight. In addition to being loaded with vitamins and nutrients, these foods are also full of fiber, which not only keeps you regular but makes you feel full sooner, so you eat less. They are low in fat and low in calories. Who would have imagined that, with all the weight-loss supplements and chemically engineered diet foods, the most effective path to controlling your weight and maintaining good health would simply be to eat a rainbow every day? So the next time you’re planning your meals, instead of considering calories, consider colors. Your waistline—and your heart—will thank you.